The 18th EXIT festival held on the Petrovaradin Fortress in Novi Sad, Serbia, finished on Monday morning, with nearly 200,000 visitors walking through its gates in the four days and nights of the festival! 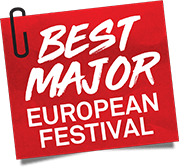 Won for the second time in the past five years, the official title of the Best Major European Festival was celebrated all over the festival on its closing day that had evened a daily attendance record of 55,000 people on the Petrovaradin Fortress for what must have been the greatest EXIT’s finale ever! This year‘s edition has surpassed the previous ones with the new production of the Main Stage which featured stellar performances by the hip-hop superstars Migos, the ultimate hitmaker David Guetta, the unstoppable art-pop icon Grace Jones, American hit rocker LP, the upcoming indie-rock star Alice Merton, Swedish avantgarde singer Fever Ray, 8-time Grammy winner Ziggy Marley, 2-time world’s no. 1 DJ Martin Garrix, hitmaker and rapper French Montana, UK’s fastest rising producer Jax Jones, hot French dance duo Ofenbach, mysterious producer ZHU, and many more! On the other 40+ zones and stages the most versatile festival lineup had also featured acts like Slaves, Helena Hauff, Red Axes, DJ Tennis, Cockney Rejects, Dog Eat Dog, Sevdaliza, Idles, Daniel Avery, Delta Heavy, Nikita Zabelin, Asian Dub Foundation, Madball, Mike Servito, Craig Richards, Brujeria, Asphyx, Tin Man, Julia Govor, Elderbrook and hundreds more. EXIT also hosted its club-partners for 2018, fabric, The Bunker NY, Arma17 and Goa Club at its internationally praised No Sleep Novi Sad stage which will launch its brand-new No Sleep Festival from 15 to 18 November in Serbian capital, Belgrade. Coming up next after EXIT is its sister event, the Sea Dance Festival in Montenegro at the turquoise 2-mile long beach near the historic town Budva, which will take place from 30th August to 1st September 2018, and among many see performances by Dimitri Vegas & Like Mike, Paul Kalkbrenner, Nina Kraviz, Alice Merton, Dax J, Antigone, Francois X, Eagles & Butterflies, PTU, Sofia Rodina and many more. The Killers have chosen three opening acts for the Petrovaradin spectacle! Heineken® – the official beer of Exit festival!